Rosanna Delphine Hinshaw1,2,3 [Roseanna Delphina Hinshaw4, Della Hinshaw5,6]. Lela Doria Lotton, born Sep 21 1893; married Bernard --. Delpha Opal Lotton, born Jan 28 1901. Lotton, Allen, head-of-household, age 38, born May 1862 in Indiana; parents born in Indiana; married 12 years; farmer; owned farm. 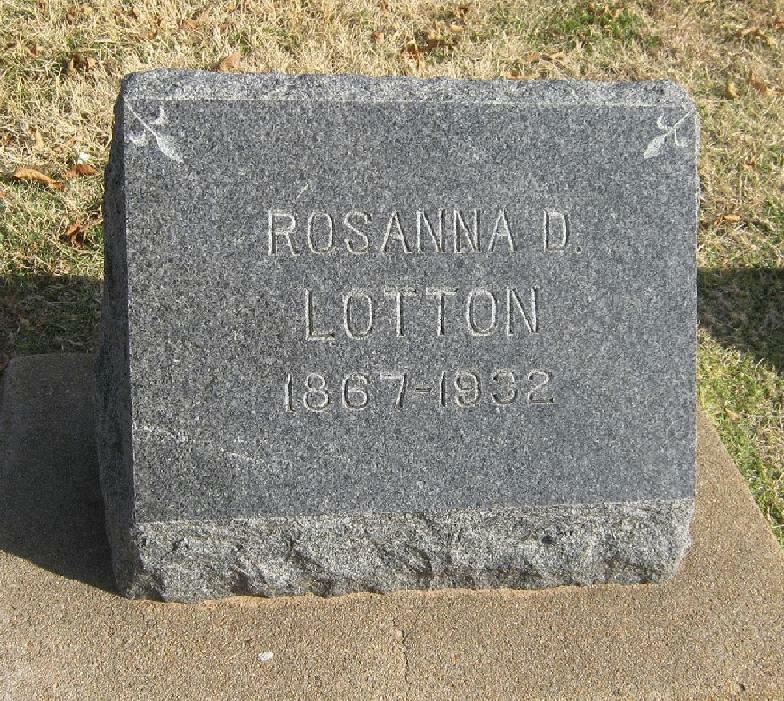 Lotton, Rosana, wife, age 33, born Jan 1867 in Indiana; parents born in Indiana; married 12 years; 6 children, 6 living. Lotton, Myrtle D., daughter, age 11, born Dec 1888 in Kansas; parents born in Indiana. Lotton, Docia B., daughter, age 9, born Oct 1890 in Kansas; parents born in Indiana. Lotton, Lela D., daughter, age 6, born Sep 1893 in Kansas; parents born in Indiana. Lotton, Everet, son, age 4, born Nov 1895 in Kansas; parents born in Indiana. 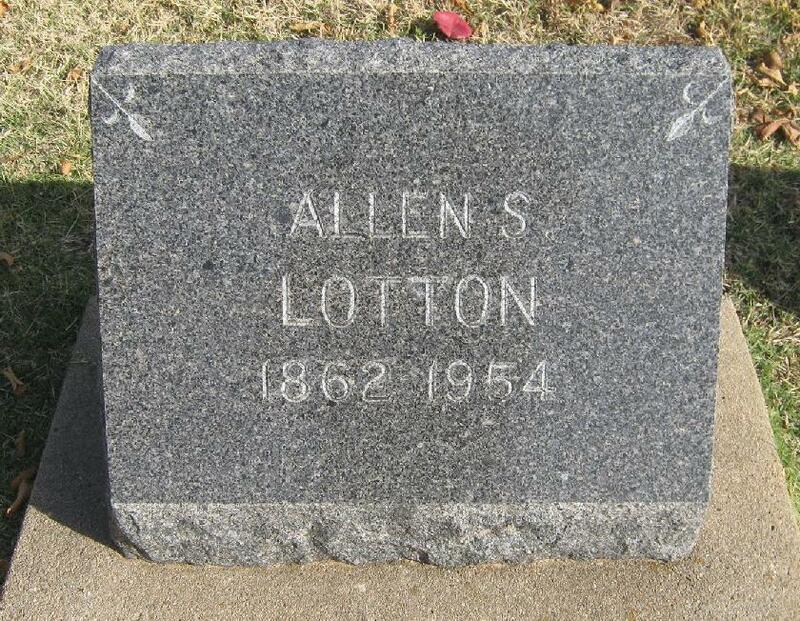 Lotton, Allen D, son, age 2, born Sep 1897 in Kansas; parents born in Indiana. Lotton, Derrel G, son, age 7 months, born Oct 1899 in Oklahoma; parents born in Indiana. Lotton, Allen S., head-of-household, age 67, born in Indiana; parents born in Indiana; first married at age 26; rented home; occupation: farmer, general farm; not a veteran. Lotton, Della, wife, age 62, born in Indiana; parents born in Indiana; first married at age 21. Lotton, Nelson D., son, age 21, born in Oklahoma; parents born in Indiana; single; occupation: mechanic, radio shop; not a veteran. Contribution from John & Lyn Matthiesen (). 1870 census, Winchester P.O., Washington Township, Randolph County, Indiana; roll M593-354, page 450, line #18, dwelling #201, family #201. 1880 census, Sterling Township, Rice County, Kansas; roll T9-0394, ED 275, page 181B, line #1, dwelling #9, family #9. Contribution from Harold Blackledge (). 1900 census, Saline Township, Woods County, Oklahoma Territory; ED 234, page 43B, line #87, dwelling #298, family #305. 1930 census, Owen Township, Kay County, Oklahoma; roll T626-1908, ED 27, page 6B, line #69, dwelling #129, family #129. Contribution from Lyn Matthiesen (). 1900 census, Saline Township, Woods County, Oklahoma Territory; ED 234, page 43B, line #83, dwelling #297, family #304. 1900 census, Saline Township, Woods County, Oklahoma Territory; ED 234, page 43B, line #95, dwelling #299, family #306.